When the California Academy of Sciences decided to host and travel ‘Dancing to the Fossil Record’ exhibit in 1995 it quickly became obvious that with a name like that we’d need a cool soundtrack. I turned to my “Ratfish Brother” Russell Wodehouse for help and he delivered in a big, big way. We needed cool science-themed music that could be played in the hallways of giant natural history museums without causing a major distraction. At the same time it had to “rock”. Background… but not background. Quite a challenge! It had to be fun to listen to if you noticed it as you wandered through the exhibit. What Russ ended up creating is a sprawling masterpiece of an album, unlike anything you may have ever heard before. 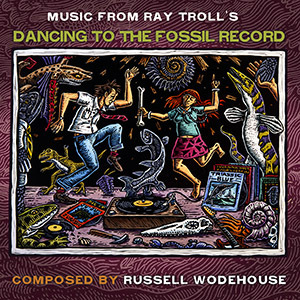 Russ did the keyboard and drum parts, wrote and sang lyrics, all inspired from the Planet Ocean, Dancing to the Fossil Record book. I recorded several interviews with scientist friends of mine and Russ went through the hours of tape and found the fun, noteworthy parts and set them to music. You can hear great nuggets of scientific wisdom from my dear friend Dr. Rainer Zangerl on a tune called ‘Extinction’s Drums’, Dr. John McCosker on shark attacks on ‘The One You Can’t See’, Dr. Jacques Gauthier on evolution on ‘Seconds in a Lifetime’ and ‘Chain of Being’ and fossil hunter/artist Chuck Bonner on ‘Planet Ocean’. Several Ketchikan musicians helped out including Dave Rubin, Dale Curtis, Shauna Lee and Claire Patton, my very own webmaster/designer Craig Koch on a soulful didgeridoo along with some truly outstanding guitar work by Zeke Kelly. 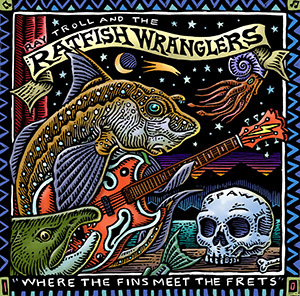 “Where the Fins Meet the Frets” is a collection of 16 original tunes recorded and performed by my Ketchikan based band, the Ratfish Wranglers, in the spring of 2007. After a year of tweaking the dials with Stephen Jackson at the controls we declared it fully baked. The CD features some incredible musical contributions by all the band members. The core band members for the recording were; Ray Troll: guitar and vocals, Shauna Lee: vocals, Patrick Troll: drums, Amos Hopkins: bass, Dave Rubin: lead guitar, Various guest musicians appear on the CD including Alejandro Chavarria, Teresa Varnell, Bob Banghart, Kim Kleinschmidt, Austin Hays, and members of the Ketchikan High School choir. Russ and Ray have been making music together since the mid 80’s. Formerly from the band The Squawking Fish, these two have teamed up once again to write and produce a truly unique collection of progressive and palatable paleo-pop profundity. From the opening notes of the Ska/Country/DooWop title song to the simple and sublime jazz- spun Reprise this album with it’s Reggae, Funk, Bluegrass, Jazz, Country, Alternative and full on ROCK offerings, covers all the musical bases. Listen. Learn. Think and tap your toes. This album is a wild ride through the depths of deep time. By the end of this musical odyssey you are guaran-gol-dang-teed to have learned a thing or two and actually have fun doing it! The CD was recorded in living rooms and basements in Ketchikan and Juneau Alaska, as well as Seattle and Richland, Washington during the fall of 2009. The majority of the album contains songs co-written by the ratfish duo. Some are solo efforts by Russ, others involved legions of players. One tune was recorded by Seattle’s infamous Big Dirt Band. Another by Ketchikan’s youthful Amish Robots. A couple of tunes were recorded by Juneau’s hottest bluegrass players while a couple of other songs feature Seattle hip hop legend Art of Verse! All of the tunes share the same inspirational source, the book and exhibit ‘Cruisin’ the Fossil Freeway’ by Kirk Johnson and Ray Troll. 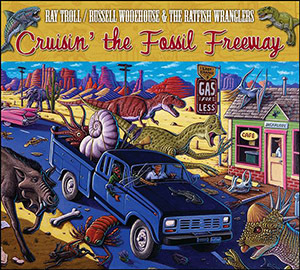 The CD was designed and engineered by Ratfish Russell Wodehouse and features a 16 page color lyric book chock full of Ray Troll’s paleo-art. 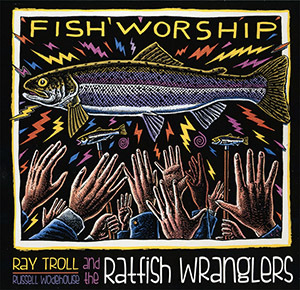 Ray Troll’s fascination with offbeat natural history topics has deeply informed his fish-filled artwork over the years and that natural curiosity has infected Russell Wodehouse, Troll’s song writing partner in slime, and the rest of the Ratfish Wranglers. This fascination is the fodder that fuels the under currents of “Fish Worship,” the third CD in the Wrangler’s quixotic oeuvre. Riddled with paleo and piscatorial perspicacity, “Fish Worship” muses on ancient rhinos, ocean acidification, how to combat rockfish barotrauma and the Smithsonian’s acquisition of one of the most complete T-Rex fossil ever found. One of the finest moments on the new album can be found in the dark yet dulcet growling trumpet solos dropped by Dale Curtis on, “Blue Lake Rhino”, a song about an unfortunate prehistoric rhinoceros that met an untimely end in Eastern Washington state some 20 million years ago. This rich caboodle of piscatorial flavored canticles spans both style and sonorous overtones. The Wranglers clearly had a LOT of fun making this album and you can’t help smiling as you listen. You’ll find yourself singing along and at the end of it all, you’ll be surprised to find you may have just learned a few things along the way.